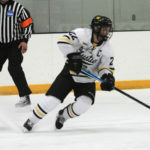 The Gustavus men’s hockey team suffered a 3-2 overtime loss to St. Thomas on Friday night at Don Roberts Ice Rink, dropping to 5-10-1 overall and 2-4-1 in the MIAC. 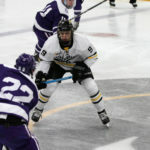 The Gusties netted the equalizer with 2:31 remaining in regulation, but the Tommies started overtime on the power play and took advantage with the game-winner 56 seconds later. 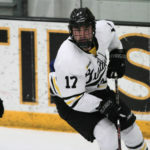 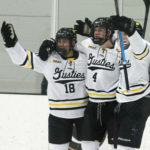 The Gustavus men’s hockey team lost 5-4 at Bethel on Friday night, dropping to 3-5-1 overall and 1-3-1 in the MIAC. 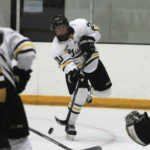 The Gustavus men’s hockey team was rewarded for putting pucks on net Saturday night in a convincing 6-2 victory over Hamline at Don Roberts Ice Rink. 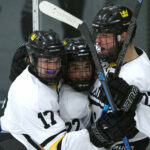 The win moves the Gusties to 3-4-1 overall and 1-2-1 in the MIAC.